Elephant hand knitted by European Commissioner for Competition Margrethe Vestager. The elephant is a product of Margrethe Vestager’s well-known habit of knitting during meetings – even high-level ministerial gatherings. 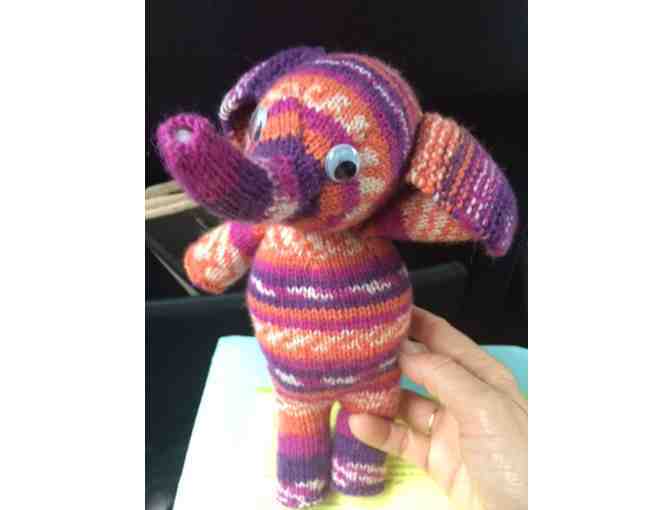 Last year when Margrethe Vestager left Danish politics to become the country’s European commissioner in Brussels, she gave her successor as economy minister, Morten Østergaard an unusual present: an elephant she had knitted herself. "I have knitted a friend for you. It's an elephant. Elephants are social, insightful animals. They live in communities - and I have to say it - they live in matriarchal societies. They bear no grudge, but they remember well." Margrethe Vestager has generously og personally donated this elephant, similar to the one she gave to Morten Østergaard. This item must be picked up at the church in Brooklyn Heights, New York, or be shipped at your own expence. Your support matters, so Danish Seamen's Church would like to use your information to keep in touch about things that may matter to you. If you choose to hear from Danish Seamen's Church, we may contact you in the future about our ongoing efforts. Copyright © 2003-2019 Danish Seamen's Church and BiddingForGood, Inc. All Rights Reserved. Designated trademarks and brands are the property of their respective owners.